The kind of paddle you prefer is a matter of personal taste, and it's hard to guess ahead of time what the best choice is. Without prior experience it can be difficult to understand why a particular paddle fits perfectly. And if you ask other paddlers, you'll get multiple answers. As a general rule I recommend our classic Greenland paddle to everyone interested in the subject. It's versatile, and I guarantee that it will serve you well - on long trips, playing in the surf, short trips, rolling practice, or whatever you might use it for, whether now or later. 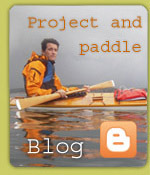 On the page "models and prices" you will find a thorough description of all the types of paddle we usually sell. On the page "Greenlandic paddles" you will find a general description of the (classic) Greenland paddle's advantages and special properties. Finally, when you've made your decision, you'll find an easy way to order a paddle in our online shop:online shop Or by sending an e-mail. Stand on the ground without shoes. Raise your arm without exaggerating. 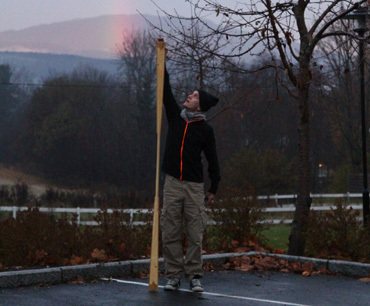 Measure the distance from the ground to your outstretched index finger's outer knuckle. Very tall people can usually trim this measurement a bit, and the not so tall people may want to add a little. Children's paddles are much thinner than adults' paddles, and since they're intended to function both as propulsion and as a balance pole, you should add about 40 cm (1' 4") to the measurement you'd use for an adult. 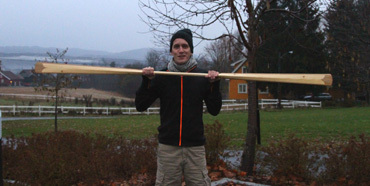 The shaft length on a Greenland paddle is a subject of constant debate. The most orthodox Greenland paddlers say the shaft should be fairly short, because that's how it was on Greenland in the old days. My experience is that a short shaft is best suited to a low and narrow Greenland kayak, but works less well on a modern sea kayak. A good rule for modern people who paddle kayaks may be: shoulder breadth plus two fists = shaft length. This estimate is intended for use with the rule of thumb regarding total paddle length provided above to produce a suitably dimensioned paddle. In other words, there's usually no reason to take special measurements for the shaft length, unless your body is unusually proportioned.